Dell recently refreshed its Inspiron notebook line with a new batch of 2-in-1s that come in a variety of configurations and sizes. Within the line’s flagship 7000 series, the 17-inch models are held up as “high-performance,” compared to their 13- and 15-inch kin. Here we review the Inspiron 17 7778, which is one rung down from the top of the heap andretails for $1,149. The only difference between this config and the top dog is that our unit has both a 128GB SanDisk SATA SSD for the OS and a 1TB 5,400rpm hard drive for data, whereas the more premium model comes with a lone 512GB SSD for an extra $200. The 17-inch model is notable since it’s a new addition to the 7000 series and, despite its large footprint, still offers 2-in-1 functionality, in theory at least. It has a 360 degree hinge so you can flip the screen all the way back to use as a tablet, a mode that requires considerable arm strength. Luckily you have the option of setting the device down in “tent mode,” which is actually quite usable at this large size. Aside from its convertability, the 17-inch model has moderately high specs and is also reasonably thin for a desktop-replacement notebook. It’s a bit chunky at six pounds, but that’s a pound less than the curvaceous HP Envy 17. Its curved aluminum chassis makes it feel thinner than its .8-inch profile. To put its size in context, the super-thin Dell XPS 15 is .66-inch thick, so the Inspiron is just a tad more substantial. The whole reason for a notebook this big is to have an ample display, and Dell has endowed this Inspiron with a beautiful 1920×1080 screen that includes touch functionality. Initially we figured a display this size would be 4K, but alas it’s just Full HD. Still, it looks sharp and there are certainly no scaling issues. Since the notebook is outfitted with a modest Nvidia GTX 940MX mobile processor, the panel is a suitable match. The full-sized keyboard is backlit with white light that looks subtle and effective. It makes working in low light easy. Furthermore, the keyboard itself deserves praise. The keys don’t have a ton of travel, but their feel, which is sort of soft and squishy, belies the shallowness of the notebook’s surface. The trackpad, for its part, is one of the best we’ve used. Its matte surface feels good and is very accurate. We were even more impressed by this Inspiron’s sound system, which is simply phenomenal. We couldn’t believe how loud it was and the amount of bass it produced, which could be felt a foot away. Dell hit it out of the park with the speakers for sure; it’s a surprising delight in a notebook that makes no claim to multimedia prowess. Connectivity takes a “one of everything” approach: one USB 2.0 port, one USB 3.0 port that lets you charge or use connected devices when the laptop is sleeping, and one USB C port. There’s also an HDMI 1.4a port and an SD card reader. Yes, it checks all the boxes, but just one USB 3.0 port is skimpy. Nicely, almost all of the internal parts can be swapped out should you choose to upgrade. The M.2 SSD, hard drive, memory, and wireless card are all easily accessible once you remove the back panel via 12 small screws. The panel pops off with little fuss and swapping out the parts is straightforward. For everyday work, this Inspiron handles itself just fine. At the heart of everything is an Intel Core i7-6500U, a Skylake CPU with two cores and Hyper-Threading that runs at 2.5GHz stock and can boost to 3.1GHz. It’s paired with 16GB of DDR4 memory, and graphics power is provided by a discrete Nvidia GTX 940MX module that has a tiny 64-bit memory bus and 384 shader cores. It’s a low-end part that’s only useful for light gaming, but it still offers a lot more muscle than integrated graphics. 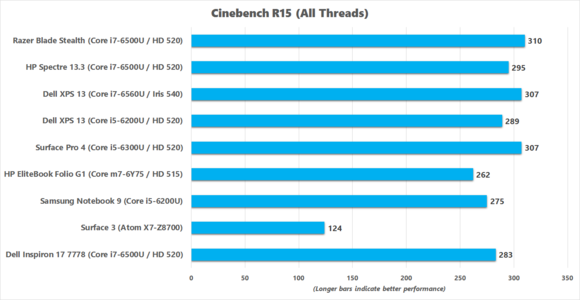 To test CPU performance, we run Cinebench R15, which puts the hurt on a chip by rendering a 3D scene. It’s pure computational athletics, and the more cores you can throw at the test, the better. Since the Inspiron 17 is only rocking four logical cores, it’s hamstrung by having just half the cores of pricier competitors, like the Dell XPS 15. The trade-off is that it costs about half as much. We also doubt anyone would buy this notebook to perform 3D rendering. Nevertheless, this test is useful for telling us if a notebook’s CPU is performing as expected. The Inspiron hit a score of 283, which is in line with our expectations for a quad-core (a la Hyper-Threading). It’s almost the exact same score we saw from the HP Spectre 13.3, which uses the same processor. 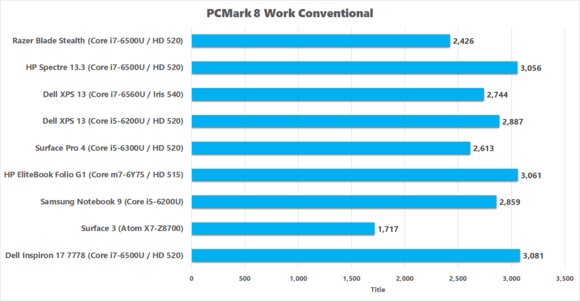 Compared to notebooks with eight logical cores, however, the Inspiron’s score is roughly half their capability, demonstrating how this test scales with the number of logical cores available. To test the Inspiron’s video editing capabilities we had it chew its way through a 30GB video file, converting it to the Android-friendly MP4 format. This takes quite a while and taxes the CPU 100 percent. The Inspiron took 107 minutes to complete the task, which is about 50 minutes longer than a system with eight logical cores, once again, but surprisingly faster than the HP Spectre with the same CPU. It also spanks Core m systems and even a Core i5 notebook like the Toshiba Portege Z30-C.
We test a machine’s capabilities in the cubicle world by running PCMark’s “Work” benchmark, a collection of tasks you’d do as a desk jockey. It includes video conferencing, spreadsheets, getting coffee, etc. Any modern machine will be able to tear through this test like an accountant through a stack of TPS reports. 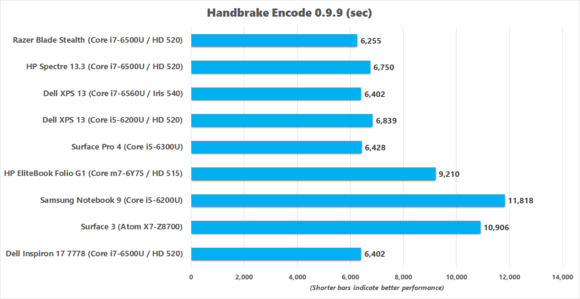 Once again the i7-equipped Inspiron performed well, barely eclipsing the HP Spectre and knocking on the door of far more expensive notebooks that also have faster SSDs, such as the Asus Zenbook Pro. It also beat the Samsung Notebook 9, which sports a Core i5-6200U. As we said earlier, the GeForce GTX 940MX is a low-end GPU, albeit a lot better than integrated graphics. If you’re looking for a gaming notebook, you’ll want to look elsewhere. 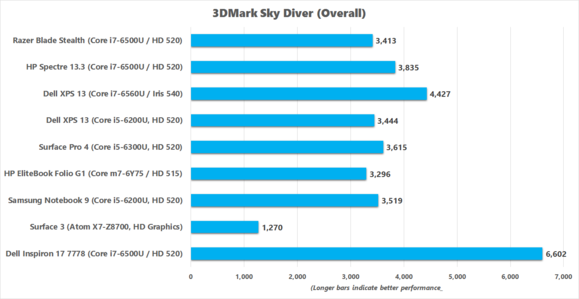 To give you an idea of where the Inspiron stands, its score on 3DMark’s Sky Diver test was about half what we saw from the GTX 960M-equipped Dell XPS 15, but double what you can expect from a system with integrated graphics, like the HP Spectre 13.3. Overall, that’s not too shabby. One of the benefits of huge laptops is that they usually hold huge batteries, but with the current trend of thinner-and-lighter, battery size often takes a backseat. With a laptop this size, which isn’t likely to be used for regular or extended travel, that might not be such a big deal. Dell says this particular configuration of its Inspiron 17 is good for up to 7 hours, 25 minutes, which is a decent runtime for a notebook of any size. 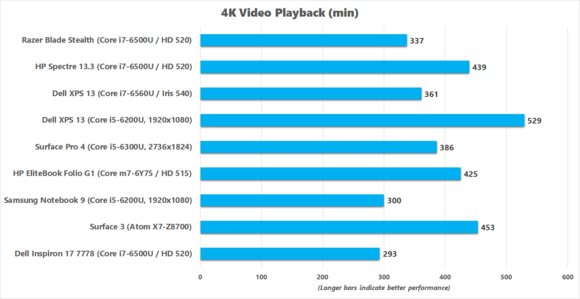 Unfortunately, in our 4K video rundown test we only achieved roughly 4.8 hours, or 293 minutes. That’s still respectable for a notebook that might be moved from room to room, and it will certainly get you through a movie or two on a long flight—of course, whether this notebook would even fit on a tray table is a different story. 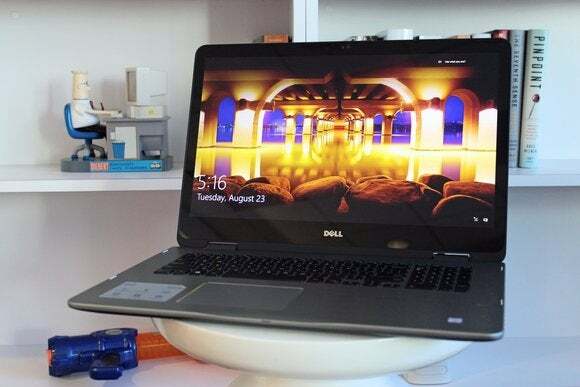 Despite Dell’s claim that this notebook is “high-performance,” we’d say it’s more at the “upper mid-level” tier. For daily desktop tasks it’s certainly fast enough. With its SSD and Skylake CPU, we never experienced any slowdowns, and the keyboard and trackpad are excellent. Factor in the booming audio and excellent speakers and you have yourself a damn fine daily driver. The only downside is that lone USB 3.0 port, a trade-off for having one USB C port apparently. But on a laptop this large, it seems like two USB 3.0 ports and a USB C port could cohabitate comfortably. Finally, the battery life isn’t great, but if there’s any laptop that’s unlikely to be far from a power outlet for long periods, it’s this one—and almost five hours is still decent. Though the design seems kind of cheap and plastic-y, the Inspiron 7000 in the 17-inch form factor is a great notebook overall. 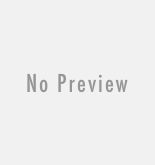 It’s powerful, has great features, is easy to live with, and is relatively affordable. And since it’s the only 17-inch 2-in-1 on the market, you’ll be the talk of the water cooler as well.